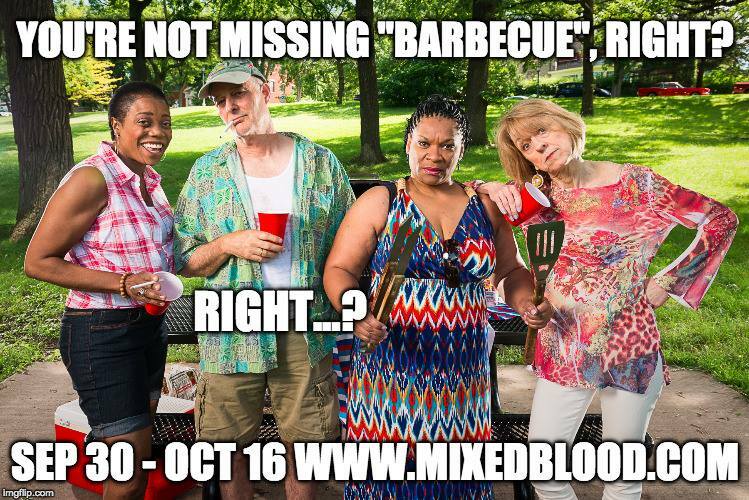 Mixed Blood Theatre kicks off its 2016-17 season with a bang with a terrific production of Robert O'Hara's Barbecue. It's a fascinating, outrageous, discomfiting comedy. The play opens in a park, with a family preparing for a barbecue party. That is about all I want to say about the plot, because the play is full of surprises. More than once, the story and telling change so abruptly that the audience has to reorient itself to the new situation. The cast is phenomenal, handling these shifts and inhabiting all of the facets of their characters wonderfully, under the sure-handed direction of Thomas W. Jones III, who is also in the cast. Regina Marie Williams, Jevetta Steele, and Sandra Struthers were standouts, but the entire ensemble was terrific and also included Bonni Allen, Aimee K. Bryant, Lolly Foy, Sue Scott, Dana Lee Thompson, and Stephen Yoakam. Besides keeping the actors on their toes, Barbecue challenges the audience to think about racial and cultural stereotypes, about the way the media presents marginalized groups, and about cultural appropriation. But mostly, it will make you think about your own biases and assumptions, whether or not you realized you had them. It's not just about race and class, but about expectations and automatic assumptions. Barbecue is a rare comedy that entertains while also questioning our prejudices, checking our stereotypes, and interrogating the very nature of truth. Whether or not you believe that theater has the power to effect change in people or in society, this play explores the deep roots of the biases that impact our everyday lives. Barbecue is a must-see that demonstrates Mixed Blood's continuing commitment to "...using theater to address artificial barriers that keep people from succeeding in American society." 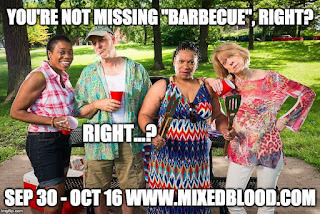 Barbecue runs at Mixed Blood through October 16, and thanks to their Radical Hospitality admission program, ticket cost need not be a barrier to anyone. In looking up the theater's mission statement for the above quote, I found their whole mission and vision statement inspiring. Check it out here. And then consider signing up for a season membership, so you won't miss any of this fantastic theater's important work.